The golf tee holder looks great! And, it arrived in time for his Labor Day tournament. Hope it brings him good luck! Karen Milano at Nimble Needle did a great job finishing it & was kind enough to send me a picture of it! No affiliation with the shop (50D Tanner Street, Haddonfield NJ 08033, 856- 354-8100, www.nimbleneedle.net), just glad to have another wonderful store to visit. Now, we have a great excuse to go to Jersey for breakfast & pick it up Saturday before Hurricane Irene blows by us dumping more rain on us. Earthquake earlier this week & now a hurricane! Wild weather for Philly! The design is all stitched & ready for finishing. 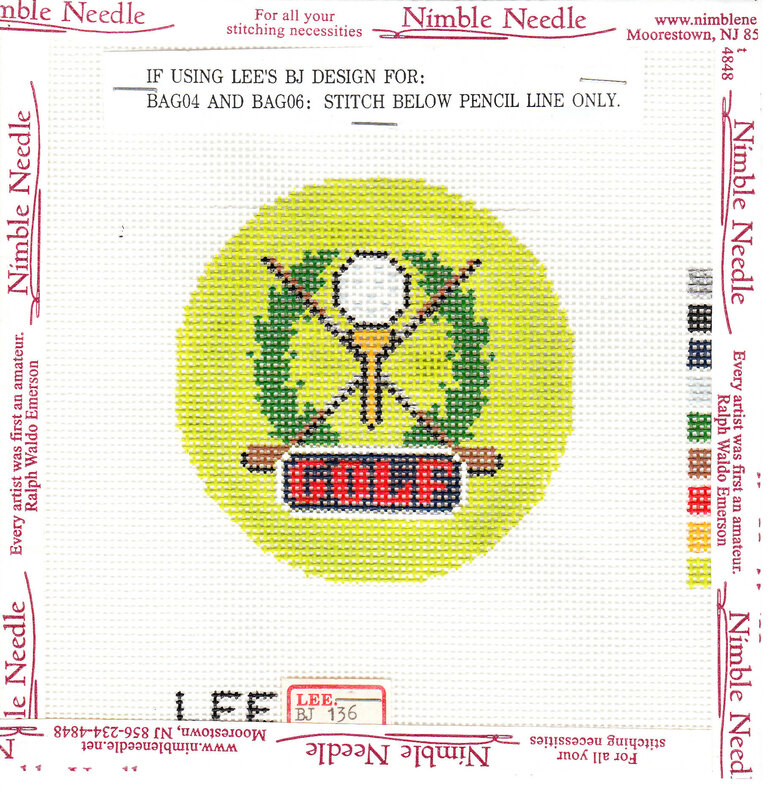 So, I have an opportunity to visit Nimble Needle again while Bill is out golfing! How appropriate. Karen did explain how I could do the finishing myself but that was about 3 weeks ago & it sounded a little tricky because the edge has to be cut so close to the design. There is no point of ruining it now. I just got the thread so I could indicate what color I used for the background & you’ll never guess the name it – I hadn’t noticed it until now. It’s Honeydew (Wildflowers, #228) – for my Honey!! I can just hear everyone go ahhhh!! 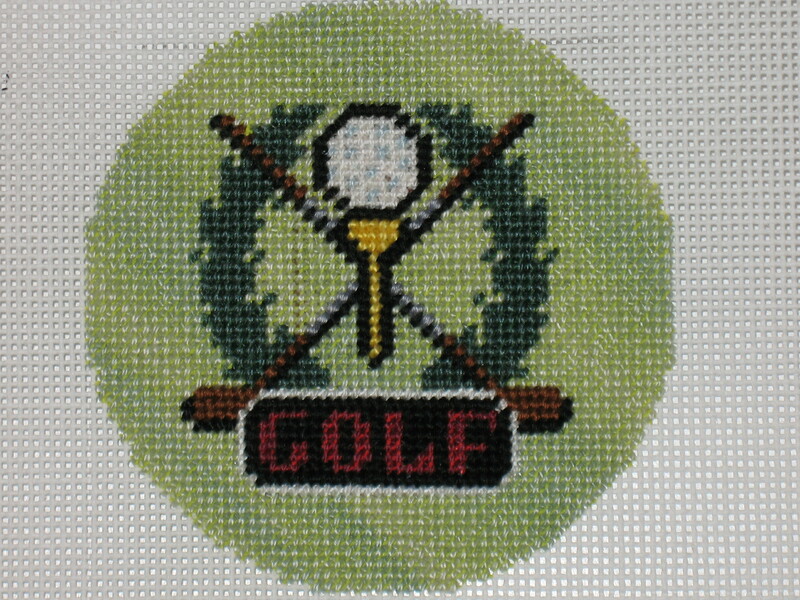 I began stitching this 3-inch diameter insert for a “golf tee holder” Sunday night. But, I didn’t get it done for my husband Bill’s birthday which was today because we’ve been celebrating. 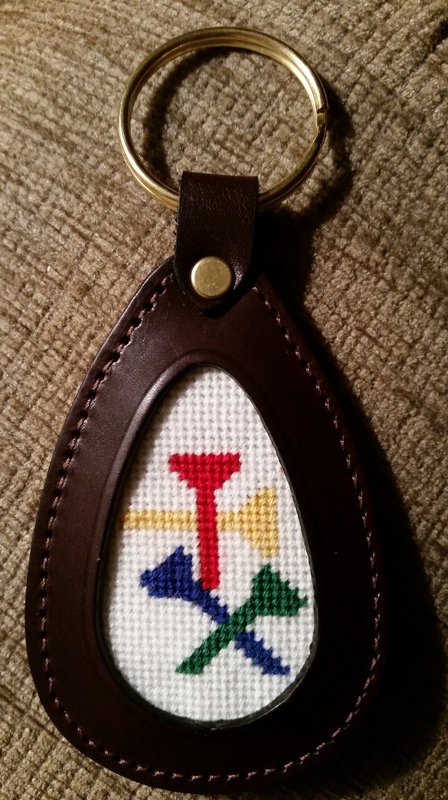 He mentioned recently that I’ve never stitched anything for him. 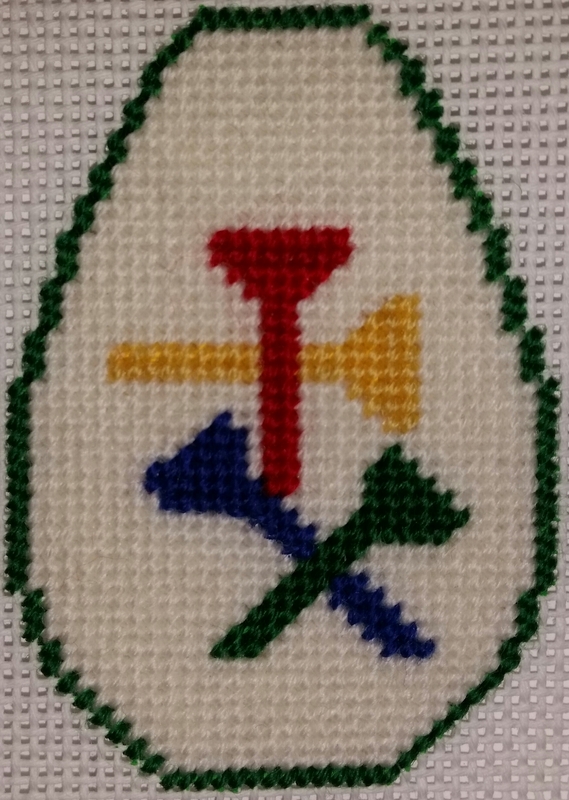 I finally remembered that I’d cross-stitched bowling towel that he used for years. But, as far as needlepointing him something, I hadn’t done anything for him. It was so fitting that my husband saw a sign for Nimble Needle on Saturday for Nimble Needle in Haddonfield, NJ when we went to Omaha Steaks (instead of our usual Chestnut Hill store)! I had totally forgotten it was in Haddonfield. So, we walked around the corner, down a couple of blocks & stopped in for a visit. Eventually, my husband mentioned I’d won a couple of national awards & I had already said I was with ANG Mainline Stitchers! And Karen Milano, the store owner, said “Are you Melita Glavin, the blogger? ?” Amazing! 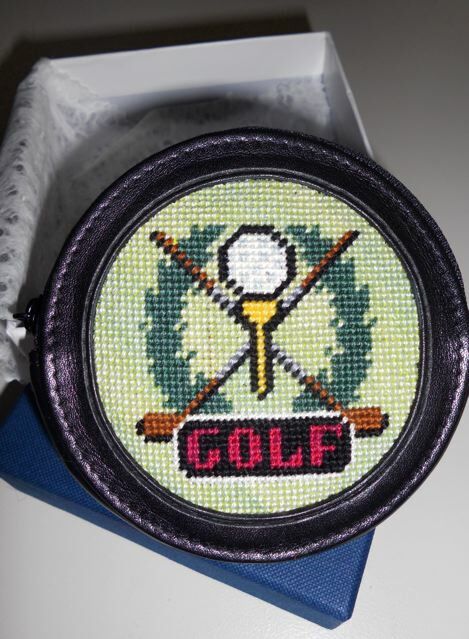 So, we were having a nice chat while I was looking around, with no intention of adding to my projects, when I spied the change purse with a golf logo & asked if it was big enough to hold his tees in it. He already has a bag for his long tees but he likes to carry short ones too! And, so, I began stitching using threads from my stash. I’m using the tent stitch & it is working up quickly. As a wonderful by-product, Karen has agreed to come to one of meetings to teach a class on a simple finishing technique for a small round ornament. So often, we want to stitch a gift for friends but the cost of finishing can be so high that you can’t give them away as casual gifts. 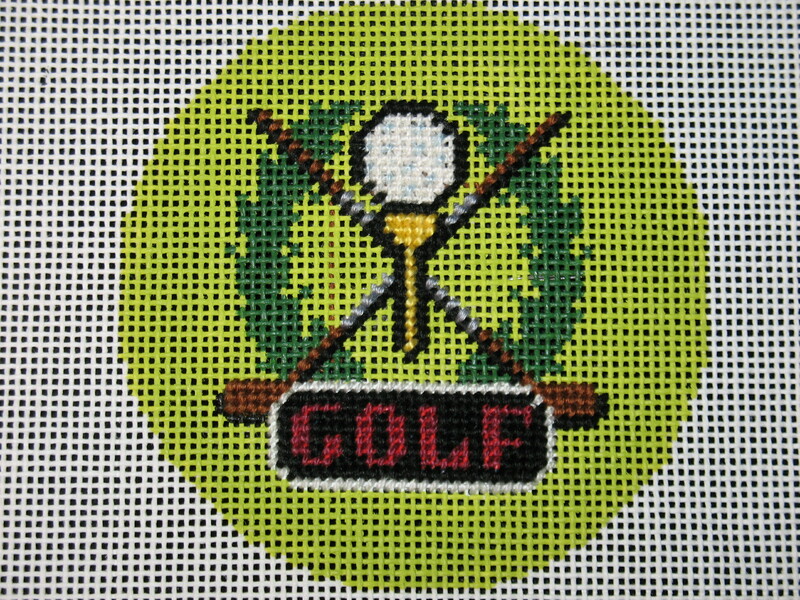 I had a lesson a year ago & it really helped me appreciate all the work that does go into finishing needlepoint. So, now when I do pay $60-$80 per piece, I realize that it is worth it. Our group will be thrilled.